If you are looking for a bright and tasty way to fix quinoa, then this recipe is definitely for you! Quinoa is a super seed though we often think of it as a grain. Known as a source of complete protein, quinoa contains lots of minerals, including 31 mg of calcium per cup, and folate too. This tiny little seed is very versatile and can be used as a pilaf, a cereal or as a substitute for rice! To make this recipe, you only need 4 ingredients – quinoa, water, mango, applesauce. With just these 4 ingredients, you’ll have a super nutritious breakfast cereal or snack. Add some yogurt and make this a creamy-licious pudding! Step 1: Cook quinoa according to package directions – 2 cups of water per cup of quinoa, bring water to a boil then stir in quinoa. 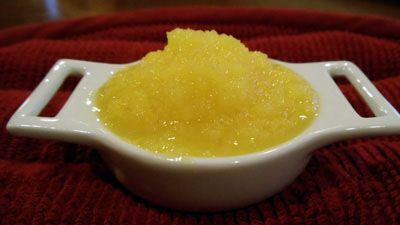 Step 3: In a blender/food processor, puree mango and applesauce together. *Add yogurt to make a creamy “pudding” or blend in chicken or pork to make a meal! *Recipe freezes well, but you’ll likely need to really stir and warm a bit to re-combine it!